Xerox Corp. has finally produced a network printer that approaches perfection. For such a small unit, only 16 inches by 17 inches, the N2125 performs as well as some printers twice its size, including the higher-end Xerox N2825. The N2125 will fulfill a midsize workgroup's needs for quality and output speed. As a bonus, it's one of the quietest network printers I've ever heard'or rather not heard. It prints up to a true 1,200 by 1,200 dots per inch in black and white and does a good job of shading and using grayscale for fine-looking graphics. Text documents come out clean and readable. There's a 133-MHz PowerPC RISC processor, a Xerox coprocessor, 32M of memory and Adobe PostScript Level 3, which means the printer rarely has to emulate any fonts. In speedy output, the N2125 has few rivals. Maximum speed is 21 pages per minute; in testing it averaged about 19 ppm. When a page contained one or more images, the maximum dropped to about 13 ppm. Those numbers put the N2125 at the top of its class in speedy output, even rivaling a line printer I recently tested. 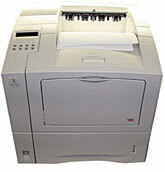 The N2125 starts processing as soon as you hit Send to fill the printer cache. And only 12 seconds pass until the first page spits into the output tray'assuming the page is all text. You might expect such speed to generate a lot of noise, but not so. The N2125 was one of the quietest devices in my testing area, far quieter while idling than most PCs. During printing, it wasn't much louder, rising from a quiet 35-decibel idle level to a top, but still soft, 49 decibels. As soon as the print job finished, it went back to idling. It's the only network printer I have ever felt comfortable placing right beside my desk. This would make a great personal printer, having both parallel and Universal Serial Bus connectivity. For network use, there's a 10/100Base-TX Ethernet interface; optional interfaces are available for token-ring, 10Base-2 Ethernet and serial connections. The toner cartridge is rated at 10,000 pages. The standard duty cycle is 75,000 printed pages per month. I cycled the N2125 through about 5,000 sheets, and the last page looked just as good as the first one. Occasionally a light toner smear would appear down the left side of the paper, which required removing and shaking the cartridge. But that's standard procedure for all cartridge-based printers. The N2125 comes with drivers for Microsoft Windows, OS/2, Mac OS, Unix and Linux environments, and they install quickly. When I first tried a preproduction version of the printer, I had some driver problems printing Web pages; however, these glitches were corrected in the final version. I sent the N2125 all the standard types of documents plus a few unique ones, and it never skipped a page.